Welcome, new readers! It's been a little over a week since I started this blog and I've already had 100 hits (not including spam bots.) Thanks for your time! Since posting updates to my Facebook and G+ statuses is not the most effective way of reminding people there's a new post -- especially if you're not on my friend list -- I went ahead and created a Facebook page. I'd love to chat with whoever's out there reading this! It would be awesome to create a community around people who love music. 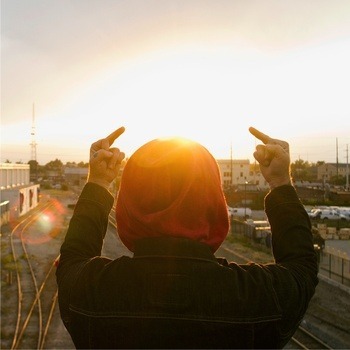 I've never seen an album cover that more eloquently captures an artist's tone than someone giving the finger to the rising sun. Like a lot of the artists who will be featured on this blog, Moreland's main themes are about self-doubt, alienation, determination in spite of the odds, and the occasional moment where life is actually pretty great. But where Moreland distinguishes himself are his whip-smart lyrics combined with solid, down-to-earth rock'n'roll. The entire album is a powerful personal manifesto. As the reviewer on Ninebullets noted, it's really hard to pick out some lyrics to illustrate Moreland's talent. So you might as well just go ahead and listen to the album. And you might as well buy it, since it's only five bucks, and it's the best five bucks you're going to spend in a long time. I've listened to Everything the Hard Way at least once a day since I bought it last week. I can't embed the songs here, but my favorites are "Hounds of Youth," "Holy Ghost Haunted," "Christian Rock," and "This Town Tonight." I, for one, hope you make it out here soon.